If you have family coming to dinner who live too far away to drive home the same day, they're going to need a place to stay. There are a few ways to handle this situation, but make plans as far ahead as possible to avoid last-minute issues. If you have enough room, you can offer to have them spend the night in your home. This could involve using a guest room, adding cots or air mattresses to the kids' rooms so younger family members can bunk together, or putting a sleeper sofa to use. Having out-of-town family stay with you gives you more opportunity to spend quality time with them after everyone else goes home. You could warm up leftovers later on if anyone is hungry again, or you could even order pizza for a break from Thanksgiving foods. 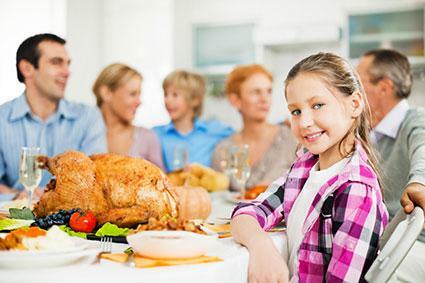 Check with other nearby relatives to see if they have room for extra family to stay overnight. Some family members might actually prefer to spend the night at a motel. You could provide them with addresses and phone numbers of nice establishments nearby. While it's not necessary for you to cover the cost of their stay, you could offer to pay for a room or two if finances are an issue for them and it wouldn't present a financial burden for you. In their Thanksgiving Dinner Portion Planner, Food Network recommends using a 1-1/2 pounds-per-guest ratio to figure out how much you need when you're buying a turkey. For example, if you were planning on 16 guests, you'd need a 24-pound turkey, which should yield about 8 ounces of cooked turkey per person once the bird has been carved. 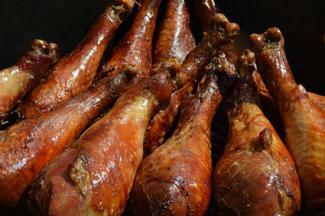 You might also consider purchasing and cooking extra drumsticks and wings to help meet your per-guest needs. Of course, Thanksgiving is traditionally a day of excess, so you may want to increase these amounts if your family likes to have seconds. Bake your pies and cakes and put them in plastic carriers to keep them fresh. 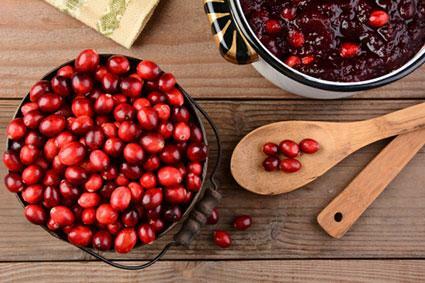 Cranberry sauce can be made the day before and chilled in the refrigerator until serving time. Candied sweet potatoes can be cooked ahead of time and then fully reheated before you create that delicious marshmallow topping. If you don't think you'll have enough seating for all the people on your list, you might want to check out your local party rental store and rent some tables and chairs. This will help you avoid seating guests at a hodge-podge of card tables and folding chairs, which will help everyone feel equally appreciated. Ideally, you'll want the rentals to arrive the day before Thanksgiving so you can set them up and do any rearranging necessary to make everything perfect. This also gives the rental company time to make corrections if they don't bring exactly what you ordered. A Thanksgiving dinner table can be a sight to behold when it's laden with a scrumptious turkey and plenty of side dishes, but it can be overcrowded when you figure in place settings and a nice centerpiece. Setting up a separate buffet table allows guests to serve themselves easily instead of passing around one dish after another as their food gets cold. Adding a power strip gives you plenty of places to plug in warming trays and crock pots to keep everything warm until dinner is over. The day or two before thanksgiving, get out all the dishes and platters you plan to use and put a sticky note on each one that says which food it will hold. Then practice arranging the dishes on the buffet until you feel you have the perfect setup. Make note of your layout so you can set up the buffet easily on the big day. Turkey is the main attraction, so either make it the first item your family will add to their plates before side dishes, or make it the center of attention and place the side dishes around it for a beautiful display. 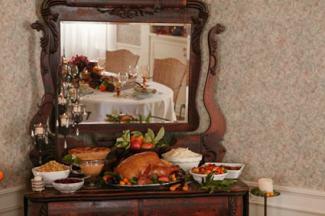 Ideally, it's best to have room all around your buffet table so guests can work their way down either side. This helps the lines move more quickly. Consider having a separate small dessert table and a drink station if you have room for them. All of your buffet table needs can be figured into your table rentals if you're going that route. The last thing you want to do after cooking a big Thanksgiving dinner is spend an hour or two washing dishes. Fortunately, there's more than one way to lighten the burden and spend more time enjoying your family's company. Using disposable dinnerware can eliminate most of the after-dinner dishwashing. Party stores like Party City offer a wide array of plastic dinnerware at various price points to suit your needs. Consider having a "dishwashing party." Set up the kitchen sink for dishwashing and have everybody wash their place settings. Older children can be drafted into helping younger children wash their dishes, and you could take care of drying dishes so they don't pile up. This also gives you an opportunity to visit with each member of your family when it's their turn, which should make the task more pleasant. You might consider hiring outside help to handle the cleanup. This is as simple as calling a local temporary employment agency or catering service and hiring someone to wash dishes and take out the trash. Having at least one working television is essential so guests can watch parades early on and then football games later. Two televisions are even better in case someone wants to watch holiday movies instead of football. Just make sure the TVs are in separate rooms so no one fights over volumes. Set out multiple decks of playing cards. Make sure each deck has a different pattern on the back so you can separate the decks easily if they are combined. Everyone loves card games like Go Fish, Rummy, and Uno. Provide board games that are suitable for a variety of ages. 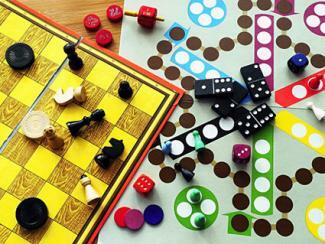 Cootie and checkers are old favorites that kids and adults can play together. Yahtzee is a fun game that's good for multiple players of various ages. Just keep in mind that having too many players in one game leaves a lot of time for boredom to build up between turns, so you might need more than one set. Share family photo albums. Adults will enjoy the trip down memory lane, and children will get a kick out of seeing the adults when they were younger. In fact, you could even arrange old photos on a poster board and let everyone guess who's who. Ask family members to bring photos marked with names on the back so no one is left out. Have coloring books or some Thanksgiving coloring pages along with crayons on hand for the younger kids. You can also keep young hands busy by setting up a card table to use as a craft station to make napkin rings that can be used at the table or taken home as a keepsake from the day. Make sure there's a football available in case anyone wants to go outside and play touch football if the weather permits. Don't forget to designate one bedroom as a quiet room where a guest can lay down for a while as needed. Although it takes a lot of time and effort to create a fabulous Thanksgiving spread for a large family, it's certainly time well spent. The memories you create will last a lifetime, so take advantage of these tips and spend more time enjoying your family this year.